In the 1980s, there was a push to keep Star Wars going - and well, it didn't exactly work out. In the years following Return of the Jedi, there was a bit of vaccum in pop culture where Star Wars once was. The prequel trilogy was just rumors, and George Lucas was more interested in working on the Indiana Jones series and other projects like Willow. However, in 1985 there was still some hope in the Lucasfilm offices to keep the franchise in the public's mind. The Marvel comics were starting to come to an end, because of the lack of movies and other tie-in comics were outselling the sci-fi fantasy title. Kenner's iconic toyline wasn't selling as well either, due to competition from G.I. Joe: A Real American Hero and Transformers. But the one area where Lucasfilm felt they could keep the series going was televison. George Lucas was interested as well, and offered to come help design programs that would add to the competition of Saturday morning cartoons and draw attention back to the trilogy. With that, two shows were produced – and there's a reason they were the last full-length Star Wars shows for over twenty years. In 1984, a live-action televison film. The Caravan of Courage, about the Ewoks was released, and it went just about as well as you would think. People didn't want Ewoks, they wanted lightsabers and droids. But hey, the Ewoks were marketable so they stuck around. It was followed up a year later with a sequel, which did even worse than the first one, but they still sold stuffed Ewoks. Meanwhile, teams were working on ideas for new Star Wars content, and the idea of a weekly cartoon came up – and for good reason, the mid-1980s featured some of the most iconic cartoons of all time, and those were primarily ads for toys (which let's be real, that's why they kept adding new vehicles to the movies). George Lucas was a huge animation fan, and got back in contact with Canadian animation house Nelvana, who had previously animated the ten-minute segment of the infamous Star Wars Holiday Special, to commission two shows about characters from the movies, as to keep some recognizable characters in the mindset. 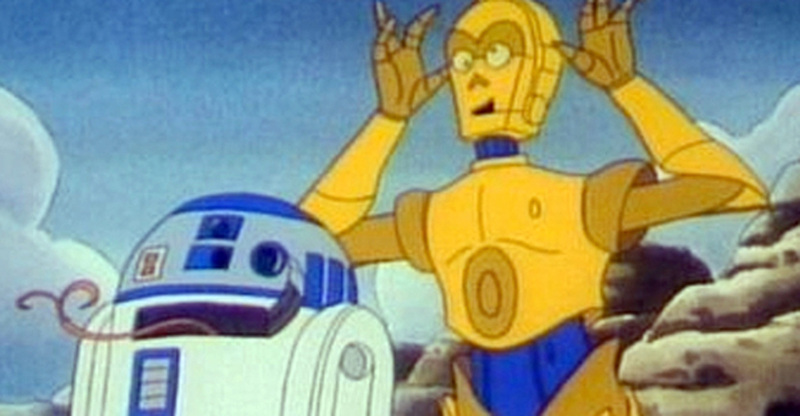 These shows were titled Star Wars: Ewoks and Star Wars: Droids, the latter about C-3PO and R2-D2. Unlike the low-budget animation from the Holiday Special, the animation was a lot more refined and detailed, and very, very colorful – which translated into the two toylines and the Marvel comics based on the shows that were commissioned as well. Both shows began airing in September 1985, among stiff competition. Droids is notable for being the first “prequel” in the Star Wars media, being set before A New Hope and chronicling the adventures of C-3PO and R2-D2 before they met Luke Skywalker. It also featured Anthony Daniels reprising his role of C-3PO, and sound designer Ben Burtt further developing the R2 beeps. 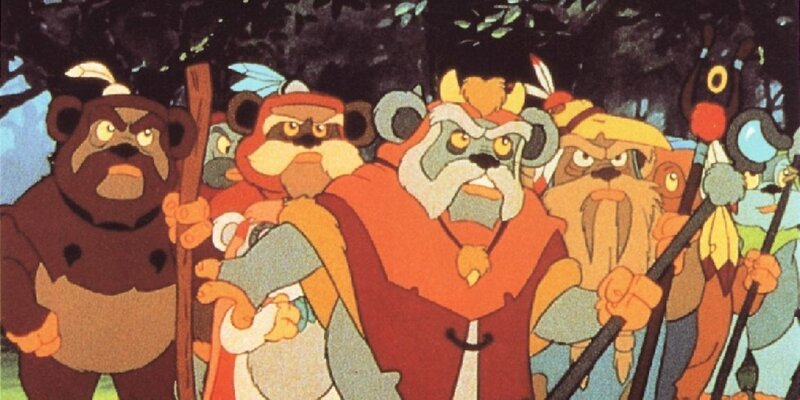 Ewoks, set between The Empire Strikes Back and Return of the Jedi but before the television movies as well, was definitely aimed at a younger audience. though it is said that the first season was more “philosophical” for what it was, but then again, so was Transformers from time to time. Unlike Droids, Ewoks was limited to the location of the stories, but used that to their advantage – introducing new aliens and monsters to the world, as well as developing the culture of the Ewoks as a whole. Droids on the other hand was more action-comedy, which is pretty well expected judging by the focus of the series. New characters were introduced, but in addition to the droids, Boba Fett showed up in the series. It should be pointed out that in Droids, a character named “Kybo Ren” appeared, a similar name to sequel trilogy villain Kylo Ren. While not a hit with critics or fans, the shows were at least being discussed and occasionally tuned into, but not as much as Lucas would have liked The toylines for each show were relatively popular, the Ewoks one featuring different characters and a new style of paint and sculpt, as well as some interesting vehicles, and the Droids line gave kids the first A-Wing toy, as well as a repainted Boba Fett, C-3PO, and R2-D2, just to give another opportunity to buy the characters. But again, in a market dominated by cars that turn into robots, a seven-foot long aircraft carrier, and the Nintendo Entertainment System, Star Wars was turning into a relic of the past. Despite the kid-centric tone of Ewoks, the show ran for 35 episodes, ending in December of 1986, while Droids only had 13 episodes, ending that June with a finale, though it was the first new episode aired since November of 1985. It just seemed that Ewoks had grasped the market just enough to push through, but ended after just over a year. The reviews were terrible, the animation cheap and the toys overshadowed in the aisles. The next Star Wars television program was the 3-5 minute episode Clone Wars in 2003, which was designed to tell the story between Attack of the Clones and Revenge of the Sith, but that show was given a near complete reboot in 2008 with the much more popular and half-hour length The Clone Wars, a series that is the only pre-Disney sale show considered canon. The original two cartoons from the 1980s were a last-minute effort to keep the brand alive, but it was too little too late, with kids and the public moving on and finding a new icon to go to. With the new toylines in the early 1990s, the Special Edition re-release in 1997, and The Phantom Menace in 1999, Star Wars came back with a vengeance, and hasn't left the pop culture since. Droids and Ewoks were referenced from time to time in other merchandise, but has mostly been ignored now that we've moved on to good animation from the franchise. Then again, it's only a matter of time before we get a cartoon just about the porgs. Then we're back to this point.